Mexico and Central American countries have turned their gaze towards renewables - solar in particular - to meet the energy demands of the region’s growing population and move towards a clean energy future. The high retail electricity prices in Central America, coupled with the region’s inherent natural solar potential, have resulted in an impending boom in its solar industry. 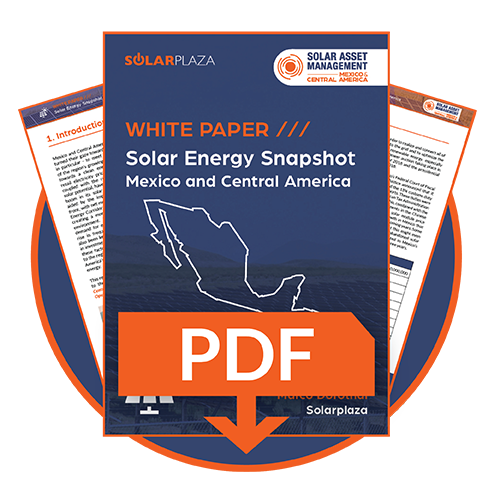 This report serves as complementary material to the Solar Asset Management Mexico and Central America: Development Finance & Operations conference that Solarplaza will be organizing on 8-10 October in Mexico City. Solarplaza is proud to announce the first edition of this industry-unique conference, aimed at unraveling the challenges and opportunities involved with the development, finance and optimal operation of solar PV plants and portfolios. The report will give an overview of the main facts and figures related to the solar energy market in Mexico and some of the key markets in Central America. It also focuses on a range of issues related to PV project development including: the demographic landscape; regulatory framework; energy auctions; distributed generation policies; and more. Complete the form below and you'll immediately get redirected to the download-page of the report.